I know that when some people think of Holland America - two words come to mind: Senior Sailors! Holland America is working diligently on a $300 million refurbishment of their existing fleet. Last year they debuted the 2650-passenger Koningsdam (sailing the Caribbean and the Norwegian Fjords), and later this year a sister ship - the Nieuw Statendam will arrive. Touring the Koningsdam colored my opinion of Holland America - as the improvements, additions and especially the decor have taken this line to a new level: one that fosters a more youthful vibe. If you are a music lover, this is the ship for you! She boasts multiple venues along the Music Walk, each featuring a different style: Lincoln Center Stage (classical concerts), Queens Lounge (BB King Blues) and Billboard Onboard featuring Dueling Pianos. All of the venues are spacious, open and comfortable. If you are a foodie, this is the place! In addition to the main dining room and lido cafe, Koningsdam offers quick bites in the Dutch cafe, Dive In (burgers and fries), New York Deli and Pizza in addition to up-charge fine dining at Sel De Mer (seafood), Pinnacle Grill (chop house), Culinary Arts Center (which doubles as a tapas restaurant and demo plus hands-on cooking studio) and Tamarind (Asian). 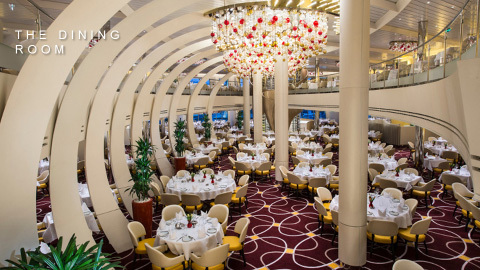 As a sharp diversion from their usual ship decor - the design team at Holland America outfitted the Koningsdam in bright, rich and contemporary colors. There are lots of reds and blues, crystal lighting and spectacular fresh flowers throughout. One of my favorite (and exclusively Holland America) features is the magradome-covered lido pool deck. The weather will never get to you! Time to have another look at Holland America. You will be pleasantly surprised too! Delighted to tell you more about my visit. Just let me know when!